Presentation outling the regulatory test exercise. Large point sources of carbon dioxide are responsible for a significant proportion of the world’s greenhouse gas emissions – with fossil fuel power stations and other large-scale industrial activities responsible for around half of the total. Carbon capture and storage (CCS) is expected to make a major contribution to reducing these emissions. Few CCS projects currently exist in the world – and a lack of experience in regulatory agencies and commercial entities of how regulatory systems would apply to such projects increases risk – potentially leading to delays and increased costs for emerging CCS projects. 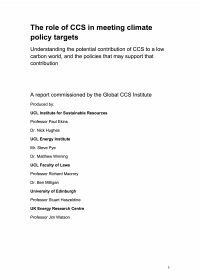 This toolkit has been produced by Scottish Carbon Capture and Storage (SCCS) researchers on behalf of the Scottish Government and sponsored by the Global CCS Institute. It guides users through a regulatory test exercise, which provides a low-cost, low-risk approach to testing regional and national legislation and regulatory systems for CCS projects, and gaining the benefits in follow-up activities. The toolkit recommends use of a real or simulated CCS project as part of this exercise to assist government agencies and other stakeholders to work together to test and improve understanding of regulatory systems. It explains how a simulated or real CCS project can be taken through the regulatory process from inception to decommissioning – a test of the regulatory process at much lower cost, time and risk than would be incurred under a real project application. The test exercise seeks to be realistic and to maximise learning opportunities, by involving the actual organisations and people that would be involved in effective handling of a CCS project. The exercise should be led by a government body with the intensive involvement of relevant regulatory agencies. Other stakeholders to involve will include commercial organisations, NGOs, and advisory bodies in the context of regional, national, or cross-jurisdictional project planning. By working together towards a common vision, and ensuring strong participation and input by key stakeholders, this toolkit will assist users to run a successful regulatory test exercise, identify follow-up actions, and gain the benefits sought. This exercise will inform government policy and developing CCS regulatory frameworks. Additionally, it should reduce the regulatory risk to CCS project developers – accelerating the consenting process and reducing the burden to all participants involved in that process – as well as ensuring an appropriate balance with other policy objectives. From April to August 2010, the Scottish Government coordinated a scenario project to assess the regulatory framework for carbon capture and storage (CCS) in Scotland. The principal objective of the project was to identify any regulatory gaps or overlaps that could be streamlined or better managed, and to evaluate the risks, barriers, information gaps and any other issues that would affect the successful demonstration and deployment of CCS in Scotland. Cradle to grave assessment of the whole project for the full raft of 56 consents/licenses required. External peer review assessment and critique of the process by observers from the Global CCS Institute and EU Zero Emissions Technology Platform (ZEP). Regulators could also look at procedures to improve the way in which environmental information is made available as part of the licensing/consenting process; and at ways to better inform the public about the whole chain of a CCS project and the many consents and consultations associated with this. Public awareness/engagement is the key issue that will determine the overall success of CCS projects. From this, participants concluded that the CCS demonstration programmes planned at UK and EU level would be the primary vehicle for testing and refinement of the regulatory approach and for effective public engagement. Ensuring that this was a key feature of the demonstration projects was as important as them assessing the economic and technical viability of CCS and will be a key part of the knowledge exchange and learning to be made available in the demonstration programmes. It is clear that all of the early enablers (developers, regulators, governments, NGOs, academics) have a big responsibility in ensuring the successful demonstration of CCS. Much of the learning around CCS – on the regulatory aspects as well as on the technical and economic ones will come through engagement with the actual project applications coming forward under the demonstration programme. Overall, given the complexity and size of the CCS projects and the large numbers of permits required, the process showed that effective management of the regulatory framework would be crucial to the success of the demonstration programme in the UK and EU. There is general support amongst participants (developers, regulators, NGOs, government) for managing project applications collectively through some form of project monitoring board that can consider the collective time management of all of the permits in the round.